Browsing the booths at an antiquarian book fair is all about being in the moment. Many of the books on display are truly rare, museum quality artifacts and priced accordingly. The majority of books and ephemera on display are collectible (for the right collector) and mostly priced within reason and common budgets. I doubt there are many instances where a buyer discovers a must own rare book and immediately whips out the checkbook and writes a $10,000 check. Could happen buy very unlikely. More likely is the curious lover of books discovering a minor rarity in the $50 to $200 range and making an impulse purchase. Since I am not eager to spend on the spot, I simply enjoy browsing and discovering something new. 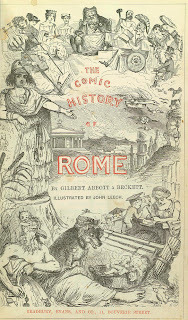 My second find at the recent Boston Fair was The Comic History of Rome and The Comic History of England (2 Volumes), Bradbury and Edwards, London. This three volume set, bound in brown cloth with very faded spines, was reasonably priced at $500. 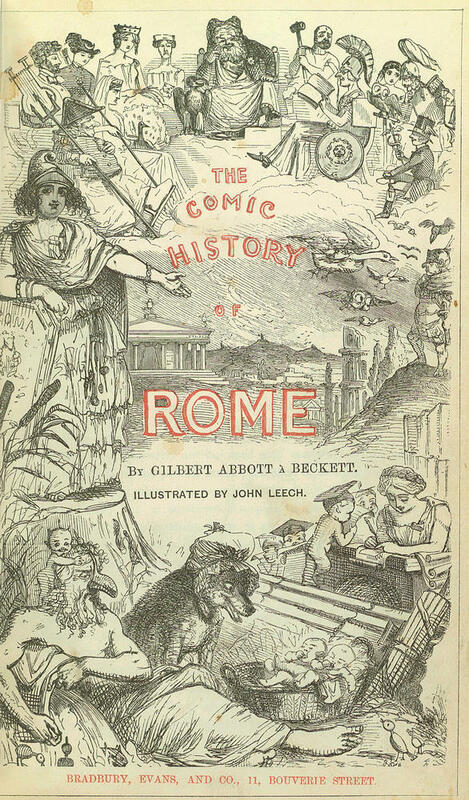 I was drawn to The Comic History of Rome due to my love of all things ancient Rome and I immediately recognized the illustration style from the 19th century. Quickly realizing that these books were associated with Punch, the British magazine of humor and satire (1841-2002, rip), I jotted down the titles, author (Gilbert Abbott A Beckett) and illustrator (John Leech) plus a note inside the front cover in pencil, "Taylor only 10 complete sets." A new discovery and a set of books to investigate, possibly a "must have." I've done some research and know now, that these were extremely popular 19th century books, reprinted many times. John Leech, the illustrator is famous for his work with Punch and as the illustrator of Charles Dickens, A Christmas Carol , 1843. I've written the bookseller who displayed the copies I viewed at the show to find out whether they are true first editions or later reprints, I didn't note the publication dates while browsing. There are a number of complete sets available for purchase, many more than 10. A true first edition would be nice to own and it will take some time to figure out who actually is selling a true first and with prices ranging from $200 to $2,000 I will take my time. The hunt is on. Were you aware of a rare books collection at C-MU while you were there?